About Thames Road When the sun is shining, Concord Rangers homely Thames Road ground is a picture. Nestled in amongst the trees you get the feeling you are in the middle of nowhere. The panorama on the other side is not too great – oil storage depots and a trailer park but the club have done as much as they can to hide these from spectators views. The ground has one small main stand and is in the process of installing some covered terracing to comply with regulations at the Ryman’s Premier league level – the highest level they have ever played at, and one that brings them into contact for the first time in 17 years with Canvey Island FC from a mile or so down the sea wall. The club has a small bar and you can sit on picnic tables behind the goal and watch the game unfold. One for the summer months I think though. How to get to Thames Road A13 from junction 30 of M25 in direction of Southend. You will eventually come to roundabout – take right for A130 Canvey Island. At next roundabout take 3rd exit signposted Seafront. Follow this road (Long Road) for a few miles, past superstore on right and then you will eventually see signs for Concord Rangers. Take right into Thorney Bay Road and then a right again after 200 yards into Thames Road. The ground is about 400 yards down this road. There is ample parking at the ground. The nearest train station is Benfleet which is on the C2C Line. Journey time is around 50 minutes from London Liverpool Street or Fenchurch Street. Bus numbers 21, 22 or 27 run from here to Canvey Island (its about 5 miles) otherwise it is a cab ride. How to get a ticket for Thames Road Pay on the door for all – £9 for adults and £3 for children between 12 and 16, free for the rest. Our last visit – April 2012 ….from town to town, I’m a real cool head, I’m makin’ real good bread” A trip to Canvey Island on a wet, wild and windy April afternoon probably doesn’t feature in any Top 100 Days Out in England programmes, but for Lewes fans it was going to be THE place to be. Through a combination of favourable results and some excellent performances, the Rooks came into the second to last game of the season still in the play off spots. Granted Wealdstone and Cray Wanderers had games in hand, and the momentum was with The Stones, especially after their 6-0 away at keeper-less Tooting & Mitcham United in the week, but every manager knows it is better to have points in the bag than games in hand (that is unless you are the team with games in hand). So this was our last away trip of a long season that had started for some of us back in early July with a friendly away at St Neots Town. Fortunately, our hosts Concord Rangers had just ruled themselves out of the fight for the play offs and so they would simply open the front door and allow us to have the run of the house, right? That is what normally happens isn’t it? Perhaps they would also put a striker in goal for us like Tooting? What are the odds of that? It has been a good season. I had nearly achieved my aim of visiting every Ryman Premier League ground, although there was still hope that a play off place and a victory in the first game COULD take Lewes up to Bury Town which was my one and only missing visit (I was in Rome at the derby when Lewes visited back in March) and enjoyed every single one. There is nothing like turning up at a new ground to see the same faces, drinking the same beer and talking about the same things week in, week out. Familiarity never breeds contempt in these circles. And what would replace my travels over the summer? Well, not that I was counting but it was only going to be 69 days after the final league game of the season before Lewes would be running out at Donkey Lane in the final of the Supporters Direct Shield against Enfield Town, and I did have a few little trips up my sleeve (Zagreb AND Belgrade derbies in same weekend thank you very much), so add in a few Rugby League games and a trip or two to the Touring Cars then I am sure I wouldn’t miss my fix. 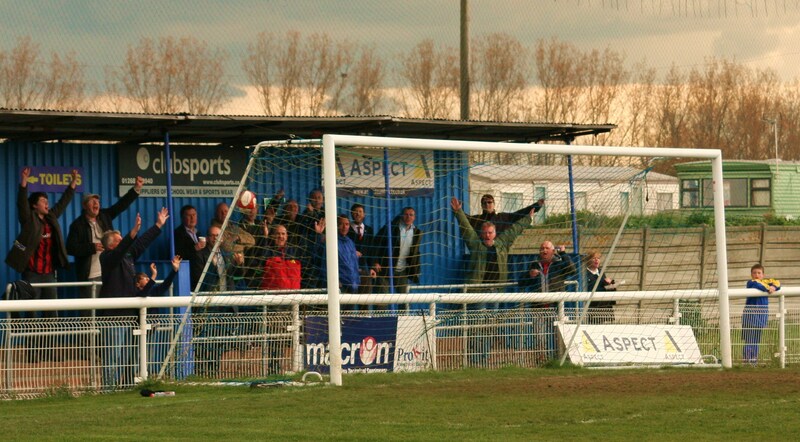 This was Lewes’s first ever trip to Concord Rangers. The club have risen like a ghoul in Michael Jackson’s Thriller video through the local leagues since being formed back in 1967. They finally gained promotion to the Ryman League back in 2008 after twice being denied entry for winning the Essex Senior League. Two years ago they won promotion from the Ryman North and competed at this level for the first time last season, finishing comfortably in 8th place. They are an ambitious side, living within their means at the end of a leafy lane in rural Canvey Island. Very Terry & June it is two – well apart from the huge caravan park on one side of the ground, and the massive oil storage site on the other. The club are one of a rare few that have joint managers, who are both called Danny. In fact it seems to be the pre-requisite to be called Danny if you are employed by the club with top scorer Danny Heale, reserve manager, Danny Clare and Danny Boy. 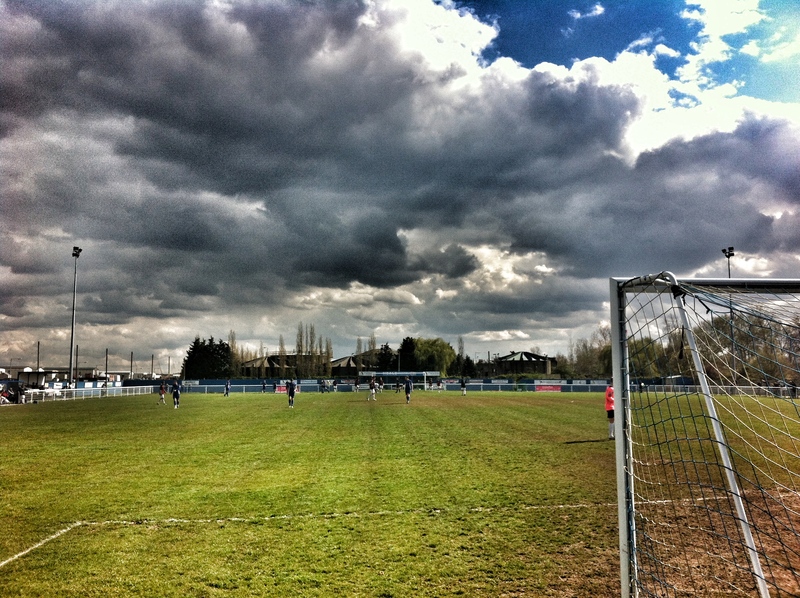 Last season we visited them for the El Grande Islande Classico, aka the local derby versus Canvey Island. Whilst the Island, only has 37,000 people living on it, it has happily supported two teams who have a friendly rivalry for a couple of decades. There was some paper talk earlier this season of a potential merger, but that is all it seemed to be. Obviously it was a slow day in the Lobster Smack, the pub made famous by Charles Dickens in Great Expectations and our first port of call for the day. The Beach Boys (now do you get the musical intro? Good Vibrations by the Beach Boys) had deemed this last game of the season a celebration of all that is good with football, and so admission was free, with an optional donation to a local charity. A nice touch from a club I have always enjoyed dealing with. I picked up the LLF at South Benfleet, the nearest railway station to Canvey Island. Deaks and Dave had packed their holiday bags – after all it wasn’t often we get to go to on an island holiday. We headed down to the Lobster Smack for a pre-match stiffener. “Have you got any ales on?” asked Terry. “No, sorry luv”. “Do you have a TV?” Joel asked, hoping to catch the end of the Arsenal game. “Yes, darling…..but it ‘asn’t worked since that switchover thing last week”. Fortunately they had plenty of flat warm Carling for us. We headed for the ground after the heady heights of the Lobster Smack. In the ideal world we could have walked there from the pub. After all, it was just half a mile away. Alas in between the pub and the ground was a dirty great oil depot, with its razor wire topped fences, big dogs and unfriendly security. We did offer to do our bit for the environment. Concord Rangers 2 Lewes 3 – Thames Road – Saturday 21st April 2012 Two weeks ago Lewes were denied one of the clearest penalties you will ever see in the game versus Aveley. That penalty decision in the nil nil draw could eventually be the difference between a play off spot and not.. But today on Canvey Island that injustice was righted to an extend when referee, Lee Venamore gave the softest of penalties in the last ten minutes which Harry Harding converted and led Lewes to their fifth win in seven games. Whilst Lewes have had a bad habit of conceding in injury time this season, they also have a great habit of scoring very early. And today was no different. Just 93 seconds were on the clock when Chris Breach, again holding the midfield together, put the ball through to the red hot Nathan Crabb and his lob from distance bounced into the empty net causing Roger to almost drop his burger. Unfortunately because of the precarious position of the league we probably spent more time in the first half looking at scores elsewhere than the Lewes performance. Everything was almost going our way. Almost. But then we forgot the fact we actually needed to hold onto the lead and despite Ingram hardly being troubled in the first thirty minutes (bar one shot he let go that hit the post), all of a sudden Concord Rangers were level when a harmless ball eluded the Lewes defence allowing the Beach Boys to equalise (probably scored by a Danny). That goal wasn’t in the script and we headed to the bar at half time downcast, especially as the results around us were in our favour. But the reason why we love football is that it can change in a heartbeat. And so just fifty seconds into the second half we were back on cloud nine as Paul Booth jinked, shot, the keeper could only parry the shot and Nathan Crabb was on hand to score. High fives all round. But the lead didn’t last long. Concord refused to lay down and equalised with a brilliant free kick. The fate of our season was once again in doubt. But then the officials took over. Substitute Hopkinson seemed to over run the ball in the area and a defender muscled in front of him to shepherd the ball out. Hopkinson fell, the referee pointed to the spot. With Paul Booth off the pitch, one of the youngest in the team took responsibility. 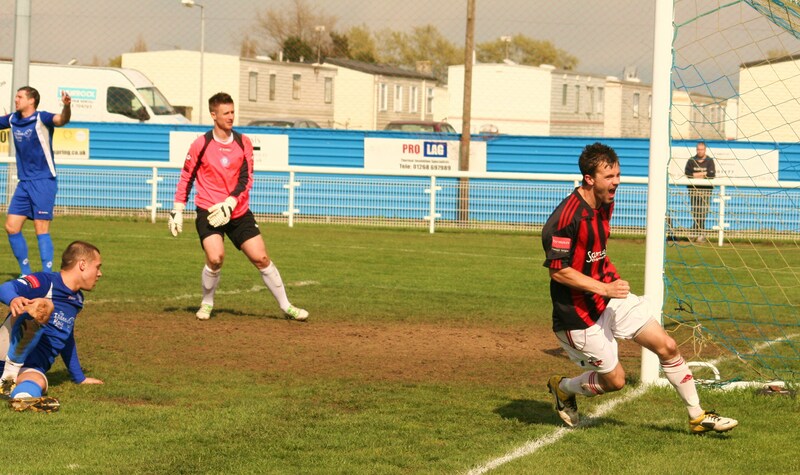 Harry Harding blasted the spot kick home and ran to Cynical Dave to celebrate. Or is that Cuddles Dave from now on – the players cuddler by choice. Concord were quite rightly furious, and in the ensuing moments they lost one of their managers (at a guess, called Danny) for his protestations. We willed the final whistle and when it came the sense of relief that washed over the traveling fans and players alike was huge. Wealdstone, Hendon and Canvey had all won, meaning the final play off line up would go down to the last day of the season. Who would have thought that six weeks ago when the team had lost away to Bury Town, relegating them out of the play offs, they had gone eight league games without a win. Since then the Rooks had played ten games, winning seven and drawing two. Ninety minutes is now all we have left, to dream what might be. One, two, three, four…Essex has the sunshine, and the girls all get so tanned. I dig a french bikini on Canvey Island dolls, by a palm tree in the sand. February 2011 I am a very goal driven person. I religiously write down what I want to achieve in my little black book that I carry around, making sure that my objectives are SMART (an acronym familiar to those who have gone through formal management and leadership training) and that I regularly review them. They are split into personal, work and of course football. You see I see football as part work part personal so it is only fair I have a category especially for it. My broad football aims this season were based around Non League football. Sure, I still had a “commitment” to the 92 Club in terms of new grounds at Morecambe and Chesterfield but they would be for later in the season. Winter in Morecambe is not the most hospitable places as I remember from two years ago when we saw Luton Town there. 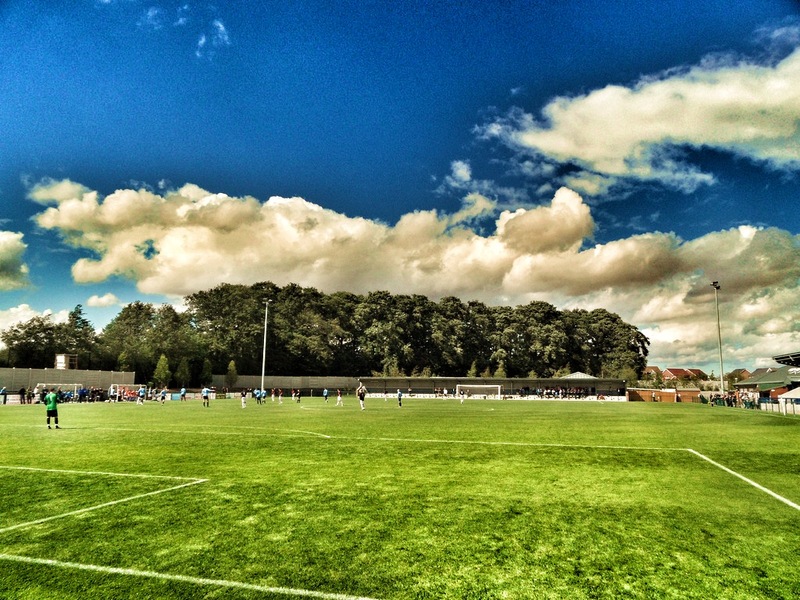 But I wanted to “tick off” the Blue Square Premier, South and then venture down into the heart of Non League football in the South – The Ryman League. Slowly but surely I had visited grounds on my travels this season and commenced the “plan of attack” on a lovely hot day in July at Canvey Island. 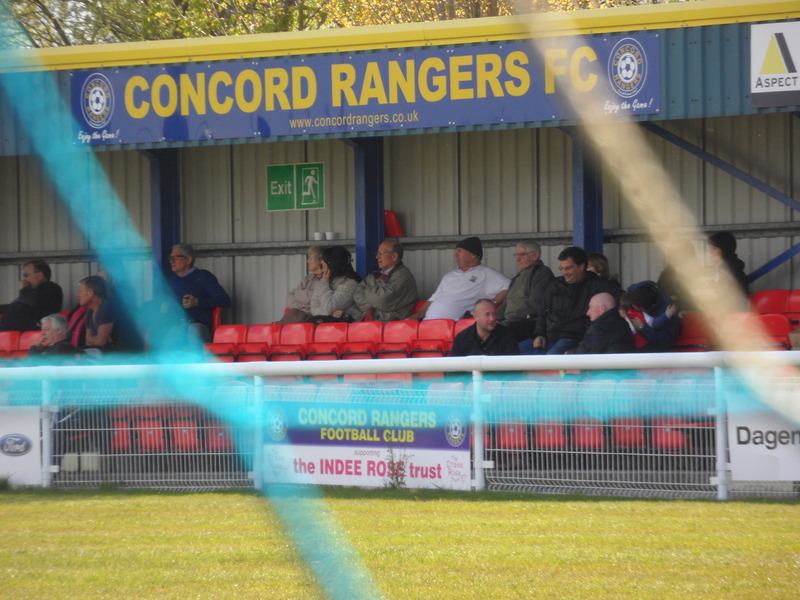 Having never been on the “Island” before, Danny and I couldn’t resist a little peak into their neighbours, Concord Rangers ground. We drove down a road that Terry and June would have been proud to have called “Chez nous” before a set of floodlights popped up like one of those houses that wants to receive every TV channel in the world with a huge aerial. We had a wander around, peering over the wall before a chap armed with a circular saw asked if he could “help us”. This man was Cliff Larkin, and he genuinely wanted to help up. Cliff is the Chairman’s brother-in-law as well as being hugely proud of what this little club had achieved and recanted the tail to us like Peter Ustinov would have done on Jackanory. First question was why the club were called “The Beach Boys”? Surely they couldn’t always be Good Vibrations down on the Island…OK I will stop that now. Well, the club date back to the glorious summer of 1966 when every boy wanted to be Geoff Hurst, Bobby Moore and Nobby Stiles. A chap called Steve Lant formed a team on the Island and they played on a pitch next to Concord Beach. Hence the nickname. The team then joined a number of leagues including the fantastically named Vange and District League where they won all the honours under the Essex sun. A move to Saturday football came in 1979 and a few years later they managed to secure some land in Thames Road and started developing the ground as we see it today. Progress on the pitch was swift and within a few years they had won all the senior honours there were to win in Essex, and got as far as the quarter finals of the FA Vase. 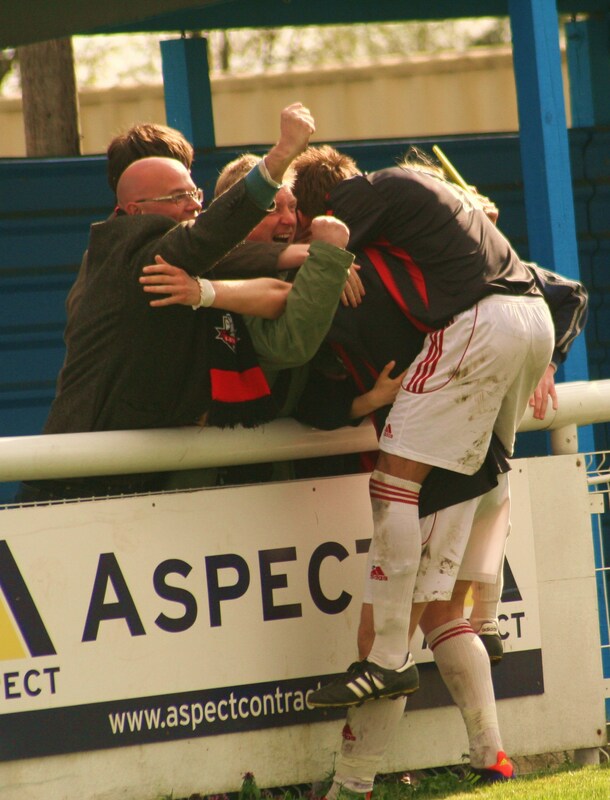 The big step came in 2008/09 when the club finally joined the Ryman League North after winning the Essex Senior League. Joint managers Danny Scopes and Danny Cowley built a team to survive it is fair to say, but amazingly finished in 5th place. This gave them a shot at the play offs and after beating East Thurrock, thanks to a goal by local legend Danny Heale (do you see a theme emerging here with the names?) they reached the final where they lost on penalties to Waltham Abbey. The club never expected to get this far and so disappointment was turned into ambition and last season they finished in 2nd place, dispatched East Thurrock again and made no mistake in the play off final beating Enfield Town to gain promotion to the Ryman Premier, and more importantly the first time to meet their neighbours Canvey Island in a competitive game. This game was eagerly anticipated for the 27th December but the freezing conditions put pay to that. So it was rearranged for mid-February, just when we would be heading back from our 5 day northern roadtrip. On a night of Ryman league derbies (including the Buy v Lowestoft and the Walton derbies), this was the pick of the lot. We actually had two options on what game to go to. Billericay Town and Concord Rangers both on the way home, and both in striking distance. So I went to the God of all decisions. Twitter. I asked which one I should go to, and within minutes I had my answer:- “Could an access all areas and guaranteed player/management interviews sway your decision? Also unlimited tea/biscuits?” Direct from the horses, well press officers mouth at Concord. In truth he had us at unlimited tea. The game was dubbed by Concord as El Grande Islande Paradiso Classico – certainly more glamorous than the Oil Derby I had seen it referred elsewhere. This was all about local bragging rights, pride and above all points as both teams came into the game within relative striking distance of the play offs. The traffic down from Lincoln was kind and the 153 mile trip saw us pitch up in Thames Road at 7.45pm exactly. It was manic down the road as the usual 150 odd crowd had been boosted by nearly 500% for the first competitive meeting of the two clubs. A bargain £9 for myself and the two little Fullers PLUS a programme is top value in anyone’s book, further endearing ourselves to football at this level. Concord Rangers 1 Canvey Island 0 – Thames Road – Tuesday 22nd February 2011 In truth it was a crap game, with few chances but typical of a game with so much more than the points at stake. Both teams wanted to dominate the midfield and so the tackles flying in where of the robust nature. The Canvey fans, probably making up at least 50% of the crowd were vocal, aiming some light hearted abuse at the home fans as well as the viewing public from the adjacent caravan park. It was great to see so many people in the ground. Young, old, blues and yellows they all crammed into the small main stand and hugged the barrier around the pitch. As part of my bribe to keep Littlest Fuller happy I had purchased her a new Hello Kitty for her collection (now up to 23), which she insisted we included in as many pictures as possible from the evening. Half time came with neither side actually creating a clear cut chance, and the start of the second period saw both sides make changes. The home fans all of a sudden found their voice, well the 7 year olds who played football on the pitch at half time did. “Oh Concord, is wonderful, oh Concord is wonderful…It’s full of crisps, hammy and Concord, oh Concord is wonderful” The joys of innocence eh! Canvey came the closest to opening the scoring after 73 minutes when a fantastic save from Concord’s keeper somehow kept out a goal bound effort, and they can probably feel aggrieved that the final chance of the game fell to Concord substitute Claude Seanla who poked the ball under luminous orange Canvey keeper Russell in injury time to take the three points, the bragging rights and probably a huge Spanish-inspired trophy. Our journey hope was a simple 30 minutes and whilst technically it wasn’t in the north, it was north of where we live and north of the Thames and so we are classing it as the final leg of the epic Northern Roadtrip. Over a 1,000 miles, 9 counties, 4 games in 3 leagues with 10 goals and 3 red cards. Who wouldn’t want to see a movie? For more pictures from the historic game please click here.